Vietnam’s thriving economy is powered on two wheels, so how come we don’t do the same? By MIKE WILLS. 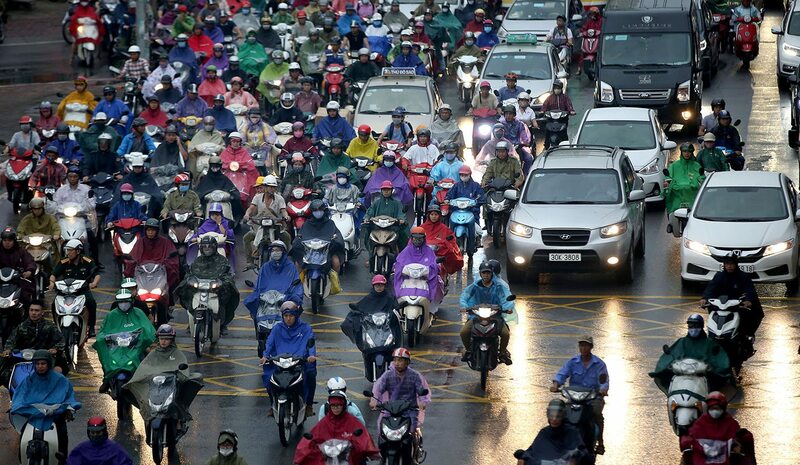 Vietnam’s capital Hanoi has seven million residents and more than five million motorbikes. The result of that staggering statistic is a city that’s a constant, noisy, tidal swarm of buzzing xe may (motorbikes) or “Hondas”, as they’re called generically by the locals, even if they’re actually Kawasakis, Suzukis or Triumphs. And it’s not just Hanoi that has a love affair with two-wheelers. They’re the king of the roads right across this remarkable and booming country – 92 million Vietnamese people have 45 million registered motorbikes with three million new ones purchased every year. Massive duties, which make new cars extremely expensive, entrench the trend. To the visiting eye, this unique transport distortion seems to work remarkably well. Although crossing the road in Hanoi is mightily intimidating at first, once you learn to step off the pavement confidently (which is always packed with an astonishing array of street traders anyway) and then, to keep moving, you can safely assume that the dexterous drivers will navigate adroitly around you. Two short and speedy trips which I made riding pillion without a helmet through the claustrophobic streets of Hanoi’s Old Quarter left me exhilarated rather than terrified. It also left me wondering why more South Africans don’t use motorbikes or scooters. The official eNatis numbers report only around 350,000 two-wheelers in SA – less than 3.5% of all vehicles registered. While a Vespa in a fashionable hue has become quite trendy in some more prosperous areas of our cities, why isn’t there a morning peak hour torrent of scooters from Soweto to Johannesburg or from Khayelitsha to Cape Town? Bikes cost far less than a car, petrol consumption is radically reduced and parking, on the Vietnamese example, is on any square inch of pavement or park that can be occupied. It’s also astonishing how much can be carried on a single bike by industrious Vietnamese who maak ‘n plan in every area of life in ways that put a Boer, and the rest of us, to shame. Families of five are not uncommon sights on a scooter in Vietnam, nor are livestock, trees, 10-metre lengths of pipe, geysers and vast quantities of food, flowers and building materials. Our own informal competition for the most extraordinary load observed during 16 days on the road was won by a scooter we cycled past just south of Dalat (a French colonial gem of a city in the highlands) which was carrying another scooter sideways across the back seat! And our reluctance to buy bikes in SA can’t be a factor of distance because the Hanoi metropole sprawls far and wide and the major national highways are full of scooters doing very long hauls. Nor can it be due to climate as Hanoi is surprisingly chilly in winter, especially for those expecting balmy Asian climes, and much of the country is drenched by monsoonal rains for a month each year. The bikes and their hardy riders simply scoot on through the grey cold and the downpours. One obvious point of resistance for South Africans is the ease with which bikes can be stolen. Another is safety. In spite of the appalling road toll on the alternatives we use – buses, taxis and cars – we obviously fear the open vulnerability experienced by a bike rider. And with good reason, because the official figure of 11,000 deaths per year on the roads of Vietnam is widely regarded as seriously under-reported, and is described as the nation’s “hidden epidemic”. Various official attempts to reduce the carnage in the past decade have failed, largely due to ineffective enforcement, inefficient public transport, poor road conditions and some atrocious driving habits which are seemingly entrenched beyond education or repair. That all sounds very familiar to us. The other major negative of the bikes is pollution. Many Hanoi citizens will drive without the theoretically compulsory helmet but very few will forego a face mask to reduce the impact of the pervasive fumes in one of Asia’s most polluted cities. Hanoi and Ho Chi Minh City (formerly Saigon) are constructing expensive and much delayed underground train systems in the hope of reducing both the congestion and the polluting particles. Hanoi authorities even have an ambitious target to ban motorbikes from the city centre by 2030 but you won’t find many local residents who believe that has a prayer in hell of happening. Seemingly, they’re as sceptical of their government’s ability to deliver on big-talking plans as we are of ours. Maybe the solution is to go back to the future.